Kilimanjaro Safari ride has been a featured attraction since Disney’s Animal Kingdom opened in 1998. The safari is a drive through an African forest and savannah with many of Africa’s most popular animals roaming freely. Guests ride a safari “jeep” which is a large vehicle holding up to 48 guests. These jeeps rarely stop and only for a minute or two at most as they have to keep moving so guests in line do not have to wait too long. This makes for a very challenging photographic opportunity. I even wrote up tips for people to increase their chances of getting good animal photos when on the Kilimanjaro Safari. Last year, my wife gave me an anniversary gift of the new Wild Africa Trek adventure tour at Disney’s Animal Kingdom. This is a backstage tour which gets you closer to the animals and, even better, gives you time to observe and photograph them. Here are some of the photos I was able to get because I was on the tour. The cheetahs are usually lying down in dark shade and very hard to photograph. 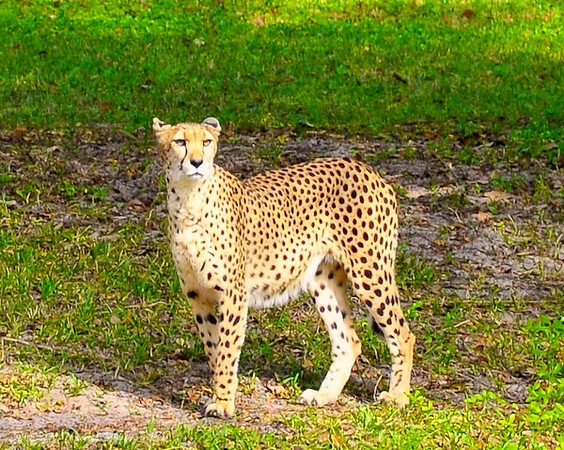 On the tour, the Wild Africa Trek vehicle was able to pull over and stop when we spotted the fastest animal on Earth moving through the sunlight. Cheetah on the Wild Africa Trek tour in Disney's Animal Kingdom. Nikon D700/28-300VR, 1/125s, f/5.6, ISO 200, EV 0, 210mm focal length, cropped. 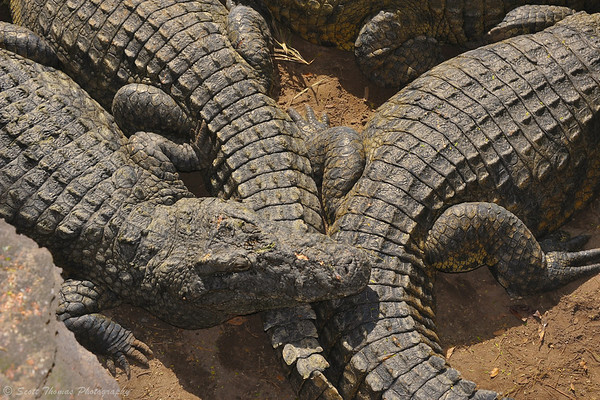 Nile crocodiles sunning themselves below one of the rope bridges on the Wild Africa Trek in Disney's Animal Kingdom. Nikon D700/28-300VR, 1/250s, f/11, ISO 200, EV -0.7, 160mm focal length. We watched two young African Elephants playing near the waterhole. They are cousins and were having a grand time. 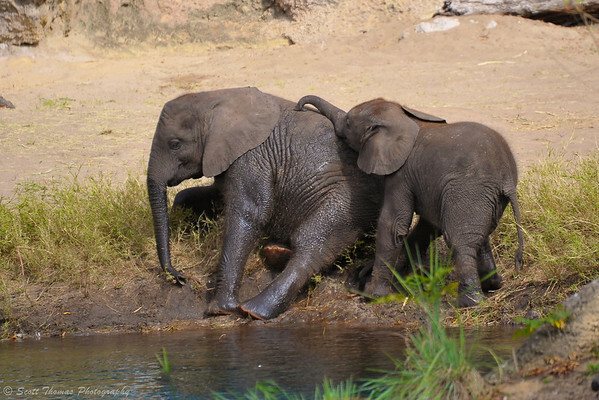 Two young African Elephants on the Wild Africa Trek in Disney's Animal Kingdom. Nikon D700/28-300VR, 1/500s, f/5.6, ISO 280, EV 0, 300mm focal length, cropped. An observation deck was built in the middle of the Kilimanjaro Safari where you get a snack and drink created especially for the Wild Africa Trek by the Boma restaurant at Disney’s Animal Kingdom Lodge. From this deck, I could observe and wait to photograph the animals as they moved about the savannah. 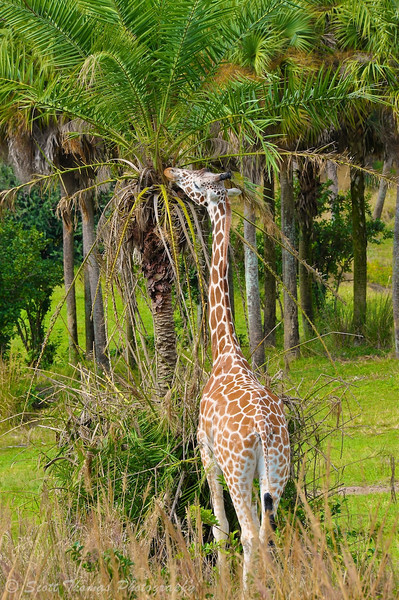 Reticulated giraffe using his height to grab a bite on the Wild Africa Trek in Disney's Animal Kingdom. Nikon D700/28-300VR, 1/125s, f/18, ISO 560, EV 0, 300mm focal length. I watched this Thomson’s Gazelle grazing about 20 feet from the deck for ten minutes before he finally raised his head. 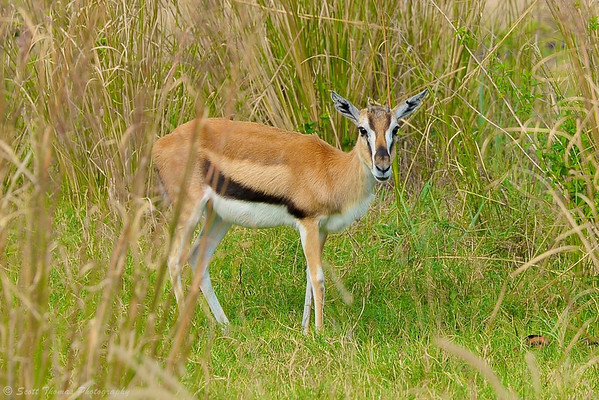 Thomson's gazelle on the Wild Africa Trek in Disney's Animal Kingdom. Nikon D700/28-300VR, 1/250s, f/8, ISO 200, EV 0, 300mm focal length, cropped. 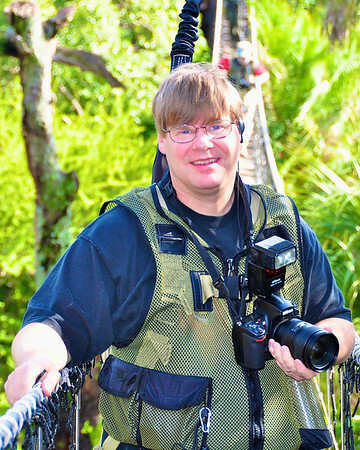 Views Infinitum author and photographer, Scott Thomas, on the Wild Animal Trek in Disney's Animal Kingdom. © Disney, Used with permission. This entry was posted in Animals, Weekly View and tagged 28-300mm, africa, african elephant, captive, cat, cheetah, disney's animal kingdom, florida, kilimanjaro safari, mammals, nikon D700, nile crocodile, orlando, reticulated giraffe, savannah, thomson's gazelle, tommie, trek, vr, walt disney world, wild, zoo. Bookmark the permalink. This is what zoos should be like, with animals free in a “natural” environment. Thanks for taking us along Scott. Disney had the space to really make the Animal Kingdom park special to both animals and humans. In this way, I hope people will understand more about how and why we need to protect these animals in the wild. That looks like a fabulous tour – I’d love to do it some day. And look at you all decked out in your photographer’s(?) vest! Giraffes are my fave but that cheetah photo is really good. Love the green/yellow colors. Thanks, Regina! Welcome to my blog. The giraffe munching that tree is my favorite! (Except for the picture of you, of course!) Wildlife photographer, extraordinaire! Don’t I wish, Kathy. Giraffes sure are beautiful and graceful so I can see why they would be your favorite. Amazing the way Disney’s Animal Kingdom has created this African area and safari ride. And $ 189 is a fair and cheap price for an African safari! We have dreams/plans going to Tanzania on our next travel – it will probably be slightly more expensive! I have to say that as a whole, the Disney Land/World experience doesn’t do much for me…. but a tour like this looks truly excellent!! Ooooooh, so jealous! What time did you go? We are still considering it…just have to figure out when. Your baby elephant photo is amazing. So incredibly cute! Scott, love the young African Elephants and giraffe shots, I would love to go on this tour the next time. First let me say very nice shots. I just found out today I will be going on this trek next month. From your experience on this tour what would you recommend for lenses? I have a D80 and am bringing my 70-200 vrII and 2x converter. Would I benefit from also bringing my 10-20 or 18-200? The 70-200 with 2x converter is going to be very heavy and long. Not sure if that will be allowed and you will not be able to carry it in a pouch. If not, it will fit in the lockers for storage. If it is allowed, then you can store the 18-200VR in the lockers instead (see below). The 18-200VR would be my choice for its size, weight and versatility. I used the FX equivalent (28-300) on my trek and found it quite adequate. Again, you will not be able to carry anything except what fits in the zippered pouches of the vest as I mention in the article. For more Disney photo tips, visit the Picture This! Photoblog on AllEars.net which I contribute to. Last Monday (April 9th), I finally had the great experience of the Wild Africa Trek at Animal Kingdom. It definitely was an incredible experience. When my wife and I arrived at the front gate for check in we were told that we would need to empty our pockets of EVERYTHING and the only things we could bring would be glasses, camera if on a strap, any needed medications and a hat. At this point I was worried that I would not be able to bring my 2X teleconverter, extra battery, polarizing filter and extra camera cards. When we arrived at the lockers to stow away any extra bags, cel phones and all else in our pockets I left my 2X teleconverter, extra battery, polarizing filter and extra camera cards in the pockets of the cargo shorts I was wearing. They never said a word about it. It may have helped since I had pockets that buttoned. They might not have cared. I don’t know which? On a side note, I had invested in a Black Rapid RS-7 Camera Starp before this trip http://www.blackrapid.com/product/camera-strap/rs-7/ . This really made carrying my camera with the 70-200 lens much easier. Which brings me to the previously unknown. I was able to have my 70-200 VRII on the trek. I used this until the point where we boarded the safari truck at which time I pulled the 2X converter out of my pocket and attaced it to the camera. They never said anything to me about the items in my pockey except to comment on the size of the lens compared to the lens the they (the guides) had. We were on the 8:00 am tour. Out of a possible 12 trekkers there were only 5 booked for this time slot. We had expected a full tour being it was the day after Easter. More room for us. We saw most animals as you will see from my pictures except the one I wanted to see the most, the cheetah. Also, the lion and tiger were resting in or near the rocks with no good shots to be had. And the White Rhino’s were not seen. Later in the day we did see them resting in their “behind the scene/nighttime” home as we road the train to the Conservation Area of the park. I did find that on this trek with a lot more time than what one gets to shoot from the constant moving Kilamanjaro Safari trucks packed with a few dozen people, sometimes the animals are not there for decent shots and you have to move on. Not like when I go to Brookfield Zoo in Chicago and spend an hour at one animal exhibit waiting to get something interesting. That being said, it was still an incredible experience. Not my best but after a short nights sleep after a late night at Epcot, they’ll have to do.